This is why games with an ESRB rating of M for Mature is NOT for young children. This was part of a story told to me by some random kid at my child’s school who was feeling especially talkative. He told me he used to play Grand Theft Auto and he would drive all over and run people over and shoot at them and kill them and then steal their money. Then he’d run from the police so that they couldn’t catch him. 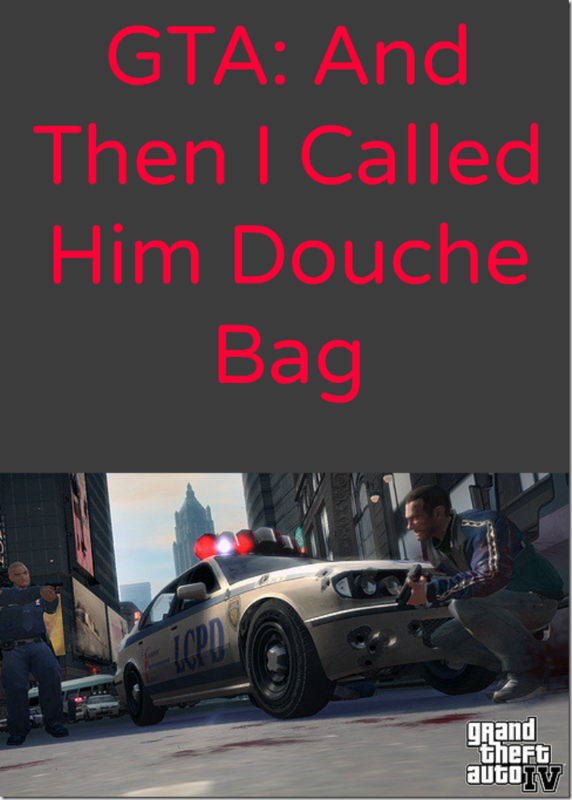 He would then call the police a Douchebag as he drove faster and faster and got away from the Police. I of course said something along the lines of it’s a good thing his dad stopped letting him play it because the game really wasn’t for young kids. That’s when he came out with the gem I quoted before. I’m glad the dad stopped him but really, it’s too late. That boy knows things that he shouldn’t know about yet and worse, he doesn’t have the capacity to really understand it’s meanings and implications. The proof is in that first line, where he calls his dad the bad word he learned from the game. When an adult plays Grand Theft Auto, they know that it’s only a game and that it’s never okay to act like that in real life. But a 7 year old can’t understand that. It’s why the ESRB created it’s rating system in the first place. They have done the work for you of figuring out what age group is appropriate for each game. Don’t just grab the newest game for your child, pay attention to the rating and stick as close to it as you can. I could see the occasional 10+ game for a 7 year old if you feel they are ready but a game rated M is for adults! Please, for the love and safety of your children, pay attention to the ratings! *I’m an ESRB Parent Ambassador but this story is unfortunately real.